Baked Cauliflower makes the perfect replacement for ‘Chicken’ in this popular Asian Recipe. 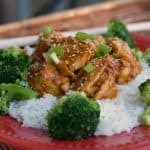 With a sweet and sticky sauce that’s bursting with flavor, this savory Vegan Sesame Chicken will be sure to be a brand new favorite! I was out shopping with my wife several weeks ago, and we walked past one of those Asian Buffet Restaurants – the “All You Can Eat” ones……. And there, taped to the front window was a menu showcasing some of their more popular recipes. Wait a minute… Sesame Chicken? Could there be a Vegan Sesame Chicken in the future? Now why haven’t I converted that recipe yet? It’s another one of my wife’s favorite take-out meals! So I snapped a photo of the menu with my trusty Smartphone so I wouldn’t forget…..and …..
Yeah… that happens more times than I care to admit. Shush…. But obviously….. I remembered that photo this weekend because, well – HERE is the new recipe. Better late than never…..right? 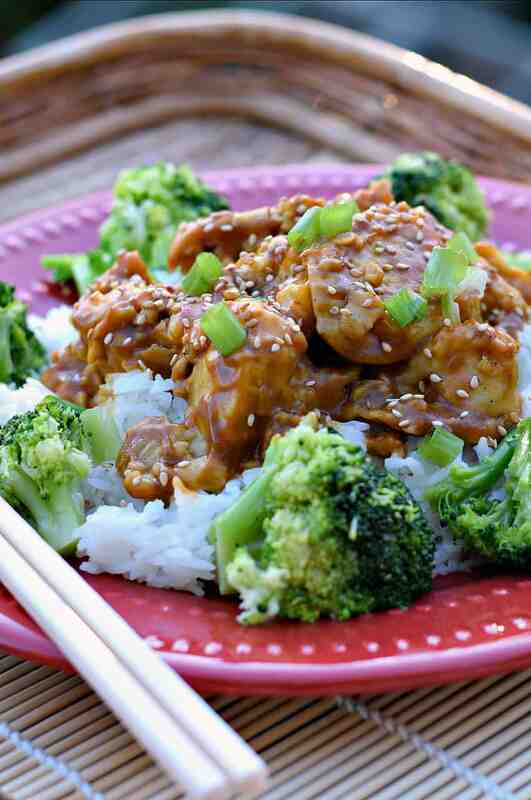 MY version of Vegan Sesame Chicken, and according to my wife and daughter….. it’s another keeper. The sauce for this recipe is what makes it so good. It’s just sweet and sticky enough to remind us of Sesame Chicken, without all the refined sugar commonly used in restaurants. And just a tablespoon or two of Tahini will add that yummy Sesame Flavor without adding a ton of oil. In a small saucepan, mix ¾ cup of Veggie Broth, 1 Tbs Rice Wine Vinegar, 3 Tbs Molasses, 2 Tbs Soy Sauce, and 1 Tbs Tahini. Stir in ½ tsp Garlic Powder, ¼ tsp Ground Ginger, and 1 Tbs Toasted Sesame Seeds as well. Stir until bubbly. Make a slurry of 1 Tbs Corn Starch and 1 Tbs Hot Water and stir this into the sauce to thicken. Remove from heat and set aside. Preheat your oven to 450 ° F. Clean and chop a small head of Cauliflower into bite sized pieces. To make your batter, mix 1 cup flour, 2 tsp Garlic Powder, 1 Tbs Toasted Sesame Seeds, and ¼ tsp Salt and ¼ Pepper. Stir another tablespoon of Tahini into 1 cup of Unsweetened Almond Milk, and pour into the flour mixture to make a thick batter. Whisk well to mix all the ingredients and then one by one, dip your Cauliflower pieces into the batter to coat. Place them on a parchment lined cookie sheet and bake for 20-30 minutes or until golden brown. At this point, how you assembly your dish is up to you….. I mixed the ‘chicken’ and the sauce together in my big wok so that everything was well coated, but that’s another pan to clean. I suppose you could also arrange the cauliflower on your plate and just spoon the sauce over the top. Your choice. Serve over White or Brown Rice and garnish with chopped Green Onions and additional Sesame Seeds if desired. This dish goes great with a side of steamed Broccoli. As always – let me know what you think. I LOVE the comments so keep them coning. 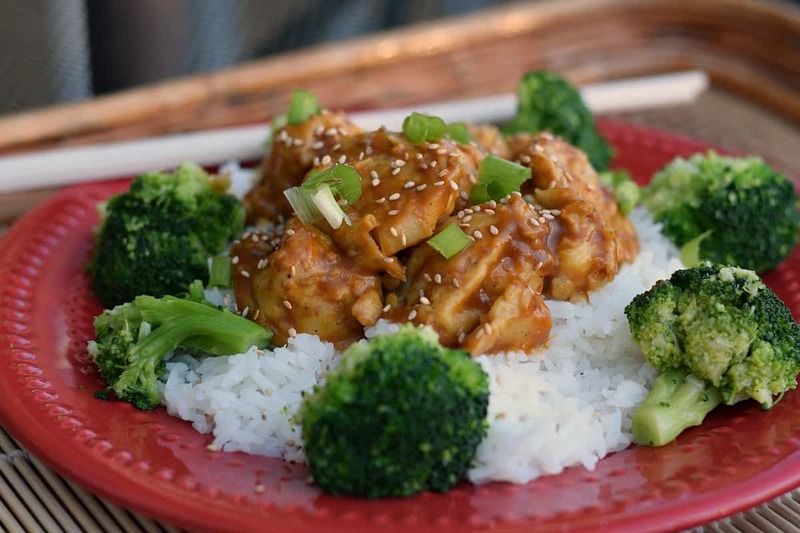 With a sweet and sticky sauce that's bursting with flavor, this Savory Vegan Sesame Chicken will be sure to be a brand new favorite! Chuck, thanks for the good old Chinese style vegan recipes! have not had this type of Asian food for oh, 20 years or so. I made this last night with brown rice and steamed broccoli! I used whole wheat pastry flour for the batter. The batter was a little bland; next time will add more spices to the batter. The sauce was very flavorful and everything came together nicely. Thank you for sharing! Do you have instagram so I can tag you in my picture? Sure do! Tag #brandnewvegan Can’t wait to see the photos! I made this last night and I followed the recipe as written. For our taste, it was a tad bland. If I make it again, I’m inclined to add some zing to the sauce. Also, the amount of sauce could be increased so there is some that will drizzle onto the rice. And I wouldn’t thicken the sauce as much as called for.